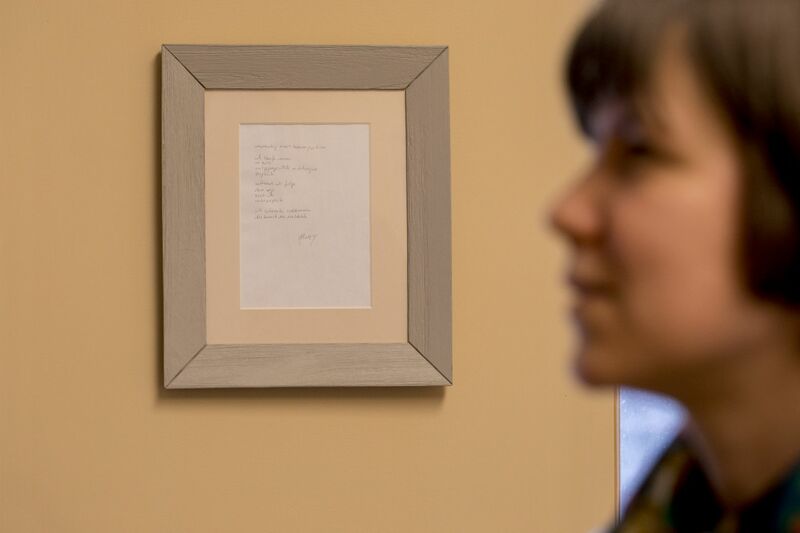 A copy of the poem “Monologue of a Tree Line” by Franz Hodjak, written in the poet’s own handwriting, hangs in the Roger Williams Hall office of Assistant Professor of German Raluca Cernahoschi. It was a gift from her dissertation adviser, Peter Stenberg, who had persuaded her to “take a closer look” at Hodjak’s poetry. Cernahoschi had seen the poem in its printed version, in the volume Open Letters, where it “conversed” with the poems around it, she says. “I knew that the selection of poems in the volume reflected not only the artistic intentions of the poet but also the effects of censorship” of the era. Cernahoschi says she marvels at the poet’s audacious way of seeing, his ability to sneak “uncomfortable truths” past the censor onto the printed page. Now, she says, she views the poem, isolated by itself in the frame on her wall, differently.